I'm using Vuforia 4.103 with Unity 4.6, and I'm having the same problem using both my app and the Vuforia Target sample, doing tests with a Nexus 7 and a Nexus 5, both with latest Android 5.0. 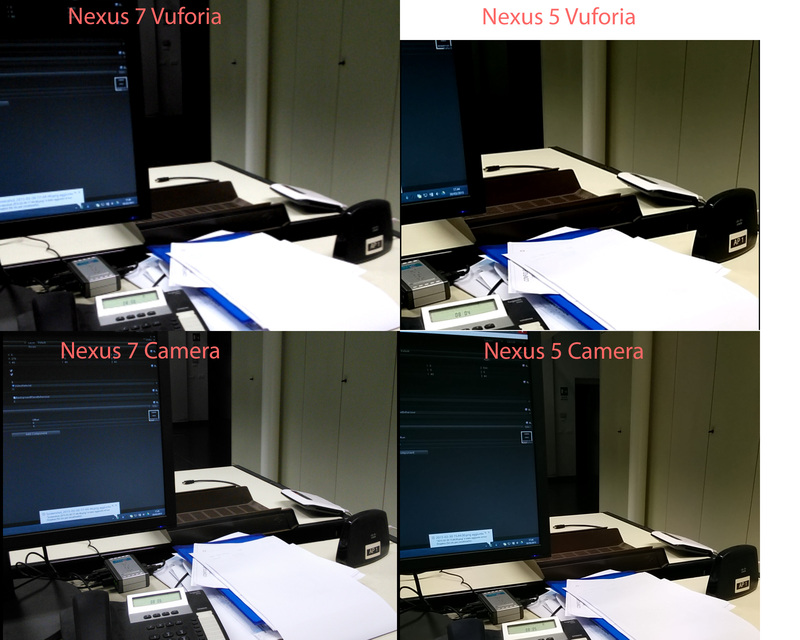 I've made a collage of 4 screenshots: Nexus 7 and Nexus 5 vuforia preview, Nexus 7 and Nexus 5 camera app preview. With Nexus 7, the camera preview quality is much lower then the standard camera app (seems half resolution). Changing camera mode quality (quality/speed) doesn't change anything. Tried with my app (return value of the operation true) and with the Vuforia sample. With Nexus 5 quality appears to be the same. Even there, chenging camera mode from speed to quality doesn't change the quality (what is supposed to change? resolution?). Another problem is that the viewport is different, the camera preview with the camera app is wider. Third, smaller problem, vuforia camera preview is darker. You can notice a little in this comparison but I had cases when there's a huge difference (I just close the vuforia app and go to stock camera, with same lighting conditions, and preview is much less dark). Is there any way to solve this problems, on my side I mean? We tested the 720p (1280x720) resolution on the Nexus 7 (2013 model) running Android 5.0.2 and found that the camera feed had some 2D shearing distortion. Testing 720p (1280x720) on Nexus 7 with Android 4.4, the camera appeared zoomed and out of focus. The 640x480 resolution worked okay on both, however, so that is what is being used if you choose MODE_OPTIMIZE_QUALITY. Thanks for providing the info. We will check the settings for that device and version. Rear camera, the hi res one. With the stock recording app records at 720p. What version of Android OS are you running on your Nexus 7? Are you seeing 640x480 with the back camera, front-facing camera, or both? What version of Android OS are you running on your Nexus 5? Ok I got that, but what are the discrimination for setting resolution of 640x480 even in OPTIMIZE_QUALITY mode? It is 1280x720 on Nexus 5. I'd like to be able to tell a user what are the specifications of his phone/tablet to be able to use the 720p resolution. The modes refer to Vuforia-specific preset resolutions that have no relation to your device's native display. If you have a quad-core graphics chip and an HD display on your device, then you can get 720p (1280x720) camera feed which might be zoomed in to fill your display screen. The highest setting Vuforia will use at this time is 720p, even if your device can do 1080p (1920x1080). The speed mode is often set at 640x480 for a device. I've partially answered my own questions by doing some research, so I understood (correct me if I'm wrong) that the camera preview in Vuforia is actually using the camera in video mode, so resolution is lower for computational needs I guess. And with Nexus5 resolution is 1080x720p, with quality, while for Nexus7 (2nd gen) is in every case 640x480p (I wonder why, because the stock video rec app can go to 720p. Whatever, do you think is possible, to use the preview as it is, and when I like the composition, click a button and take a picture with the camera at high resolution, and then superimpose the 3d object in the current position?